commented on "JARO's Rustic Leather Banquette Seat"
JARO can help you design that special rustic look for your venue with either polished or raw timber. There are plenty of rustic looking leathers or leather look vinyls for easier cleaning. 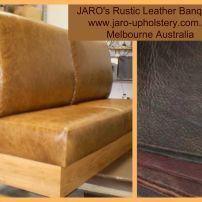 For further information email enquiries@jaro-upholstery.com.au.